A traditional nebulizer combines a liquid flow (usually water) and a gas flow (usually cleaned, dried compressed air) to produce a stream of droplets. A typical nebulizer will produce about 10,000,000 droplets per mL of liquid nebulized. Once each droplet evaporates it leaves behind a particle of non-volatile residue, no matter how clean the liquid. The cleaner the liquid the smaller the particle of residue, but residue particles always remain. This non-volatile residue can act as a significant interference when attempting to nebulize a particle suspension. 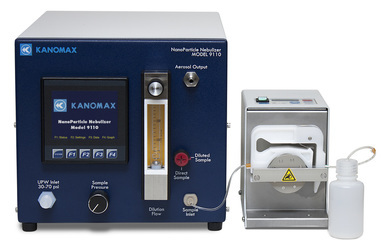 If the particle size is measured the residue particles can distort the size distribution. In a toxicology study the non-volatile residue material can coat the particle to change the surface properties of the particle. The NanoParticle Nebulizer is a new type of nebulizer that produces droplets with a very small peak diameter of < 1 micrometer. Droplets even smaller than this size can be produced using Electrospray, providing the liquid is suitably conducting. High-purity water is essentially non-conducting, therefore requiring additives to make it conducting. Electrospray can also be prone to blockages as the physical dimensions of the Electrospray nozzle are very small. 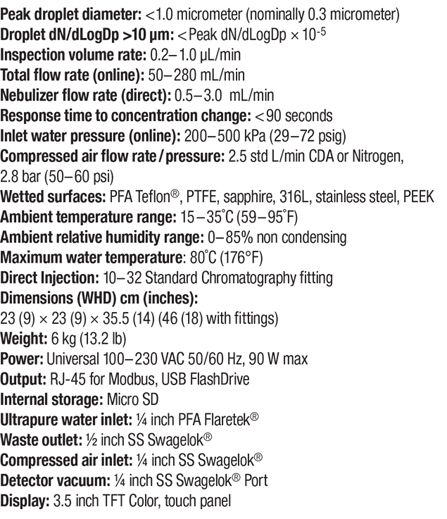 The NanoParticle Nebulizer does not require a conducting liquid and has successfully nebuilized particle suspensions as large as 500nm (a size Electrospray is incapable of handling).